This week the Trump-Russia scandal continued to unfold, but that wasn’t the big story. What stands out in Week 23 is the kleptocracy — a pattern of conflicts of interest and pay-to-play — and the Trump regime’s utter irreverence towards ethics and past standards. As the 100-day mark approaches, Trump has no legislative accomplishments and his foreign policy can best be described as an embarrassing mess. Instead, Trump seems focused on enriching himself, his regime, and his business contacts. The pace and boldness of corruption whiff of a man who is aware his days in this gig are numbered. Seven weeks have passed since Trump’s tweet accusing Obama of wiretapping Trump Tower. He has yet to offer any evidence or apologize. American Oversight, a group of liberal lawyers, is suing the DOJ and FBI seeking proof for Trump’s wiretapping claim. Trump has yet to offer any evidence or apologize for his accusations that Susan Rice committed a crime by spying on his campaign. 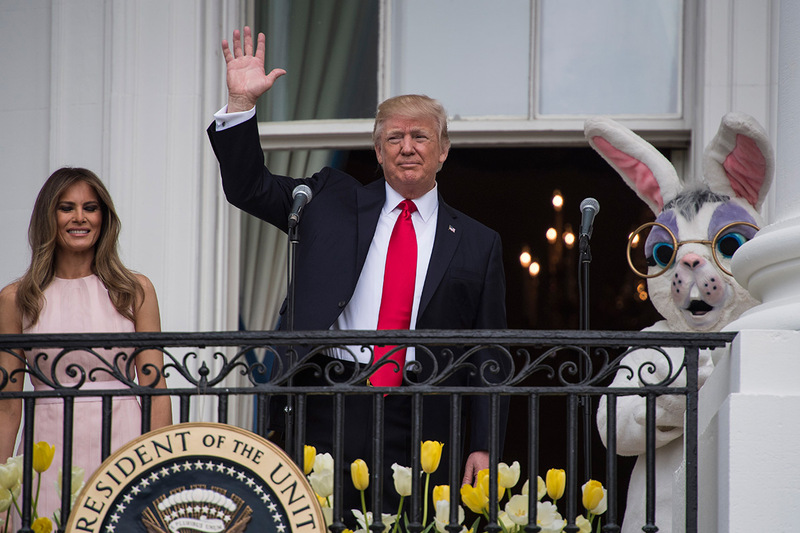 Trump hosted a disastrous Easter Egg Roll, including telling the children, “We will be stronger and bigger and better as a nation than ever before,” and forgetting to lift his hand to his heart during the National Anthem. NYT reported on violations and a raft of potential conflicts-of-interest as Trump appoints former lobbyists, lawyers and consultants to craft policies in industries where they formerly worked. Office of Government Ethics director Walter Shaub noted that Trump rolled back an Obama requirement that appointees not accept jobs in agencies they recently lobbied, and that Trump has granted waivers allowing appointees to take up matters which benefit their former clients. On Tax Day, breaking precedent with every modern-day president, Trump did not release his tax returns, nor explain why. WSJ reported that in the first quarter, Trump’s campaign funds paid $500k to Trump’s companies including hotels, golf clubs and restaurants. Trump raised $107 million for his inaugural, doubling Obama, although Trump’s crowds and festivities were markedly smaller. It’s unclear where unspent money has gone, while numerous “pay-to-play” stories emerge. For example, Rachel Maddow reported on a $666,000 gift from a businessman named R. W. Habboush, which led to meetings between his son and both an NSC official and Bannon to discuss how to open up business with Venezuela, which is heavily sanctioned by the US. Trump dropped his campaign promise to let Medicare negotiate bulk discounts on prescription drugs after meeting with pharma lobbyists. Ivanka was granted China trademarks during dinner with Chinese President Xi Jinping at Mar-a-Lago. As reported in Week 22, Trump also changed his position saying China does not manipulate its currency. FT reported Manafort stepped in to the China action, advising Chinese billionaire Jiehe on how to access to Trump’s $1 trillion infrastructure plan. Trump billionaire outside adviser, Steve Schwarzman, CEO of Blackstone which has significant holdings in China, stands to gain from US-China policies he helped to shape. USA Today reporters pieced together that Trump companies own 400+ luxury condos and homes worth $250 million up for sale or rent presenting people, corporations or foreign interests an opportunity gain influence through purchases. Further, since Trump launched his presidential bid, Trump companies have sold at least 58 units for $90 million — almost half to LLCs. Since Election Day, 14 units have been sold for $23 million — half to LLCs. The House Oversight Committee sent a letter asking Trump for details on how and when the Trump will donate profits made from foreign government officials. Reps. Elijah Cummings and Jason Chaffetz signed the letter. Two days earlier, without explanation, Chaffetz said he would not run for reelection in 2018, and that he may leave office early to return to the private sector. Despite denials by the Trump, Erik Prince had close ties to the Trump regime, including riding the Acela with Kellyanne Conway, providing advice to Trump’s inner-circle including Michael Flynn, and entering Trump Tower through the back entrance. As mentioned in Week 21, Prince had a one-on-one meeting with a Putin insider in Seychelles on January 11. He is also Betsy DeVos’ brother. Without explanation, the national security official leading the DOJ investigation into whether the Trump regime colluded with Russia abruptly resigned. CNN reported that the FBI used information in the Steele dossier, which they independently confirmed, for their FISA warrant against Carter Page. CNN reported Russia tried to use Trump advisers, including Page, to infiltrate the campaign. Page is one of several advisers US and European intel found to be in contact with Russian officials during the campaign. The DOJ said is it preparing charges against WikiLeaks founder Julian Assange, with Sessions saying Assange’s arrest is a priority. Strangely, the Trump regime has turned on Assange, after lauding him during the campaign. Sessions left open the possibility of prosecuting US news organizations for publishing leaked information, and stories on the Trump-Russia scandal continue to pour out. As part of a custody battle, InfoWars’ Alex Jones said he is a “performance artist.” As noted in Week 19, InfoWars and Breitbart are under FBI investigation for their roles in Russian hacking of our election. NBC compiled a seating chart of attendees at Putin’s December 2015 RT celebration dinner. Other than Flynn seated next to Putin, Stein was also at Putin’s table and Assange appeared via satellite. NBC also reported on efforts by RT to promote Jill Stein (and hurt Hillary) in the primary. The House Intel Committee announced it will reopen its Trump-Russia probe ex Nunes. Sally Yates, James Comey, Mike Rogers, John Brennan, and James Clapper have all been invited to testify. Nikolai Andrushchenko, a Russian journalist and Putin critic, was beaten to death by strangers. He is the 12th “mysterious” Russian death in recent months. Like their interference in the US, Russian sources are flooding French social media with fake news ahead of France’s election. Reuters reported on a Putin-linked think tank that very purposefully and carefully orchestrated an attack on the US election. Fake news, pro-Kremlin bloggers, and cyber-attacks were all part of the plan. Exxon sought a US waiver to resume drilling in their Russian joint venture with Rosneft — a deal forged by Tillerson, who is ring fenced from Exxon for only one year. Amid outcry, permission was denied by the Treasury Dept. The UK Election Commission has launched an investigation of Farage’s Leave.EU for its funding. The involvement of Cambridge Analytica — which also allegedly has ties to Bannon and the Mercers and the Russian hacking of the US election — was not declared to the election watchdog. Sessions said he was “amazed” that a US judge “on an island in the Pacific” (aka Hawaii) could block Trump’s Muslim ban. Sessions took a fact-free swipe at another ethnically diverse city, saying New York City was soft on crime and plagued by gangs murders. ICE immigrant arrests were up 33% in the first two months of the Trump regime, including a doubling of non-criminal arrests. The first protected DREAMer, Juan Manuel Montes, who is 23 and has lived here since age 9, was deported by Trump. Ironically, a federal lawsuit brought on behalf of Montes has been assigned to Judge Curiel, the jurist infamously attacked by Trump for his Mexican heritage during the Trump University case. Trump signed an executive order to review high-skilled H-1B immigration visas. In a troubling provocation, Russian aircraft were spotted flying off the coast of Alaska four times in four day this week. Trump held a secret meeting at Mar-a-Lago with former presidents of Colombia, threatening to undermine the country’s peace agreement with rebel leaders. The meeting was arranged by Sen. Marco Rubio, a member of the Senate Intelligence Committee, and was not on Trump’s schedule. In another embarrassment of US foreign policy, Trump promised “we are sending an armada” —the USS Carl Vinson carrier group was being deployed to waters off the Korean Peninsula. This was not true. On Wednesday, Tillerson said that Iran is in compliance with the nuclear deal. On Thursday, Trump said Iran was not in compliance. Trump offended our S. Korea allies with a claim that the country “actually used to be part of China.” Trump apparently gleaned this “knowledge” from his conversation with Xi Jinping. For his upcoming visit to London, Trump demanded a carriage ride with Queen Elizabeth II down a strip that leads to Buckingham Palace. Three month in, Trump has only filled 4% of key roles in the executive branch. And with all the international hot spots and conflicts, the State Department remains largely vacant, including Deputy Secretary. A State Department official who helped shape the Iran nuclear deal was summarily reassigned for criticizing Conservative Review and Breitbart. The Surgeon General was also quietly dismissed on Friday evening, without explanation or a full-time replacement. DeVos’ pick to head the Department of Education’s Office for Civil Rights said she faced discrimination for being white. In his first three months of office, Trump has made 417 false or misleading claims. Trump first quarter job approval stood at 41%, the lowest of any modern day president by 14 points in Gallup polling. The Resistance claimed a major victory, bringing down Fox News icon Bill O’Reilly. Some speculated that the rise of Trump, and his backing of O’Reilly after recent allegations, laid the groundwork for O’Reilly’s fall. Hundreds of thousands are expected to march on Earth Day in the global March for Science in DC and at 609 satellite locations. Trump with Melania during the 139th Easter Egg Roll on the South Lawn of the White House. Shortly after, Trump forgets to put his hand on his heart during the National Anthem.